WARNING: This is a preview of UBOOT The Board Game. All components and rules are prototype and subject to change. 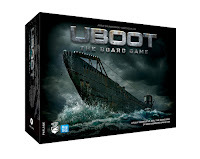 UBOOT The Board Game is a cooperative, real-time strategy game that puts you in command of a German VIIC U-boat. Players must work together to carry out orders, including navigating, maintenance, and combat (plus lots more). Complete with a required app, this game is as immersive as the U-boat itself. Before I get started, I just want to mention that the copy of UBOOT The Board Game I received is a preview copy, and as such, only comes with one mission, which is essentially a training mission. My experiences with UBOOT The Board Game are limited, due to the nature of the preview content. That being said, what I saw was enough to get a pretty good feel for the game as a whole. Despite there being a lot of components in UBOOT The Board Game, setup is fairly straightforward, and the rules aren’t too complicated. 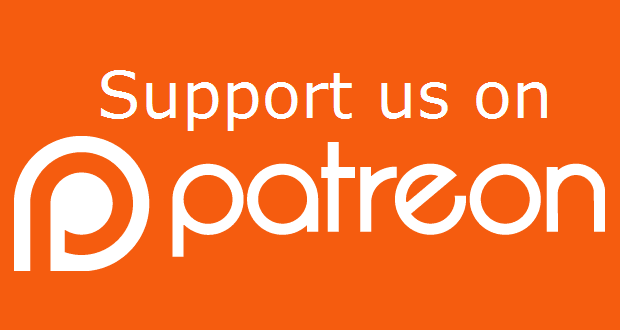 I will refrain from doing an in-depth rules and setup explanation (as those can be had in the rulebook and other sources), but I will give an overview of each section. Starting positions of all the sailors. Each color represents sailors attached to the Captain, Chief Engineer, Navigator, and First Officer. The shape of each sailor's base helps players identify which is which. Setup begins by each player choosing a role. There are four roles to choose from: Captain, First Officer, Navigator, and Chief Engineer. One of the interesting things about UBOOT is that each role fits a different type of person. For example, the rulebook states The Captain as being a fitting role for natural-born leaders and quick decision makers, whereas The Navigator would be good for players with good spatial awareness or sailing experience. I am decent at special awareness, but have little to no sailing experience. For me, learning the role of Navigator was difficult at best, but when I was the Captain, I felt like I was able to make the right snap judgments as necessary (I blame this skill on having worked on the broadcast side during live events…those things can get hectic fast!). Although certain roles are recommended for other people, that in no way means that I couldn’t ever be the Navigator, or that I’d always be stuck as the Captain. Each role has its learning curve, but just like each game you’ve learned up until now, all it takes is a little getting used to. Once all the players have chosen their roles (or you take on all four if you’re playing solo), the game components need to be divvied out to the appropriate players. To keep things from getting a little out of hand, I won’t explain what each player receives. Needless to say, each role receives tokens, cards, and miniatures that correlate to that role’s, well, role. Part of the Captain's set up. The difficulty is chosen by placing one of the Captain's tokens on one of the three spaces on the far right side of the Order Track. The space farthest right is for an easier game (as it gives to additional spaces for the Captain's orders; more on that further on), and the first space (over the red "XV" and "XVI" on the morale track) is for a harder game (as the captain only has 7 orders to give each cycle). Once all that’s said and done, it’s time to boot up the app and go over the mission briefing. This is the last thing you do before things get real(time)! Really, that’s all there is to setup. My first time looking at all the components in the (large) box, I wondered what I had gotten myself into. Fortunately, the rulebook is well-written, and setup wasn’t at all confusing for me. Now that you’ve got everything set up, it’s time to set sail (so to speak). Once you’re finished with the mission briefing, start the mission. From here on out, time is always progressing, although you can control how fast or slow it goes. But be it known, this is a real-time game, and everything that happens happens on the clock, and there is no going back. If you thought me explaining setup could get lengthy, then there’s no way I’m going to get into all the nitty-gritty of the rules. That being said, don’t be alarmed! Yes, the rulebook is some 30 pages long, but it’s all simple enough. Here are the basics. The game ends in a lose if all the players’ miniatures/characters die (such as leaving the observers on the deck and then submerging before bringing them back inside), the morale track is forced to move one more step and there isn’t another step on the morale track, the submarine is sunk, or the mission time runs out. Alternately, the game ends as a win for the players if all mission objectives (as shown on the app) are completed before the time runs out. Actions are carried out as ordered by the Captain, and not a single action can be carried out unless the Captain orders it. Each player controls 4 characters/sailors for the first watch (first 6 hours and third 6 hours), and 4 different sailors (on the opposite side of the role tile) for the second watch (alternating hours from first watch). Each sailor has a maximum of 3 action slots (which are cleared out slowly), so the Captain must ensure that all players and sailors are utilized as best as possible (i.e. some sailors are better at certain tasks than others, so they would be assigned those tasks. 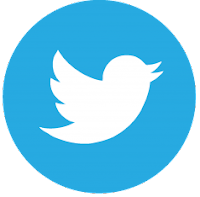 Otherwise, if a character isn’t so good at a task, as indicated by their icons, they must place two activation tokens on that character instead of one.). The following is a brief explanation of what each player/role does. The Captain has a finite number of orders they can give within a 12-hour time frame (in-game time, not your real-life clock-on-the-wall time). Any orders given after the maximum is reached will hurt your crew’s morale (see above image). The worse the morale gets, the worse things happen to your crew. The Captain, then, must discuss with the other players what needs to be done ahead of time, so when the Captain gives the “Mobilize” order (i.e. "Everyone move your miniatures! 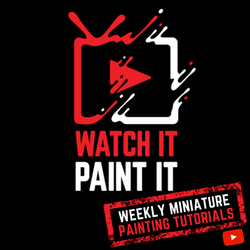 "), everyone can get into a future position with one order, rather than Mobilizing, realizing someone isn’t in the right area to do a certain job, and must therefore use another Mobilize order to get that player’s mini to the correct spot. Doing it this way leaves one less order for the Captain to give later. Basically, the Captain is in charge of giving orders (i.e. seeing the bigger picture), using the periscope, and firing torpedoes. There’s more that goes into these things, but for our purposes, just know that this is what the Captain does. The Captain’s second in command, the First Officer is the one who interacts directly with the app and enters in orders and reports events as they come up. They are also responsible for the helm as well as first aid (which, by the way, has limited supplies, so try not to get too injured, or you may run out). Thanks to the observers on deck, you can take a gander at your surroundings. You can even swipe the image left and right to get a 360° view, or switch to gyroscope mode and spin around in your chair for the 360° view. The Navigator is in charge of plotting the (correct) course, sending men to observe, as well as cooking for the rest of the crew. Cooking is important, because if the crew doesn’t eat well (or at all), then morale takes a hit, which brings the game closer to a poor ending. Observers on deck (when the submarine is surfaced, obviously) are the main way you’ll spot contacts. Once you have observers on deck, you can go into the app and manually look out across the vast ocean for any sign of enemy ships. Also, watch out for enemy aircraft, and be ready to get your observers back inside so you can submerge the sub at a moment's notice! There's a slight problem in the Officer's Quarters. Fortunately, we have two of our best men there to fix it. The Chief Engineer keeps things running properly. If something breaks, the Chief Engineer fixes it (this happens a lot). They also operate the U-boat’s propulsion and ballast (submerge or surface), which is pretty important if you want to go anywhere. This tactical map is to help players visualize where they are in relation to the enemy. Throughout the game, the Captain will be issuing orders, and everyone will be doing what they’re told. Don’t worry, however, as there’s way more than just the Captain barking out orders. Everyone needs to communicate with each other about what’s going on in their sector. The Captain might be hard pressed to remember everything that’s going on, so keep them informed. Communication is key to success; the Captain is just in charge of deciding which problem is most urgent. To carry out an order, one or more sailors (i.e. one of the characters on the role/crew tiles) must be in a particular location before the order can be given and then carried out. If the sailor in position has a symbol matching one needed to perform the action in that location, then that sailor carries out the action and receives one activation token. 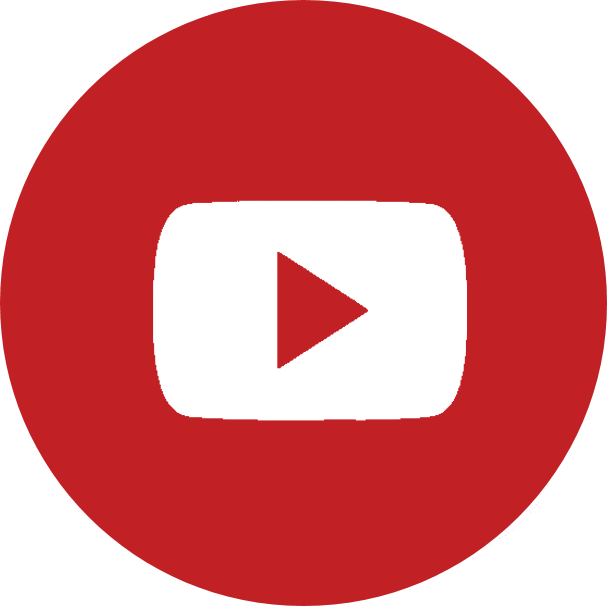 However, if that sailor does not have the matching symbol, they can still carry out the order, but will require an extra activation token to do so. Remember, each sailor only has 3 activation spots, so this eats up all but one of them. Sailors may be injured, have a headache, or something else affecting them. If this is the case, an effect may apply to the sailor in question (i.e. 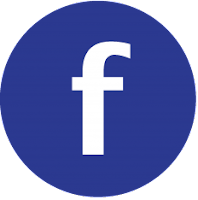 the affected sailor cannot observe until the problem is fixed), or a health token may be placed on one of the activation slots, making it harder for that sailor to do tasks or be activated. Keeping crew healthy is key to success! In this image, the Chief Engineer and a Mechanic (1st watch) both have a health issue, and an Exhaustion token is now taking up a valuable spot on their activation spaces. Another Mechanic (second watch) is also injured, and an injury token is placed on one of his activation spaces. Throughout the course of the game, things will break down. Lights will go out, the torpedo tubes will need repair, and a hull breach might even let in the floods. Usually, things start out as a mere nuisance, meaning that broken torpedo tube should probably be looked at sooner or later, but it’s not urgent. If left unattended for a certain period of time, the problem will worsen. If left ignored (due to a more pressing issue, I’m sure), then it can get even worse, causing massive problems if not fixed immediately. The urgency of fixing something can get forgotten amid the myriad other tasks that need to be performed. Remember to communicate! The Navigator uses the map, a pencil, ruler, and protractor to plot a course. Make sure your Navigator knows what they’re doing, otherwise you may run off course (hey, it was our first time playing!). Likewise, once an enemy ship is near (either by visual identification or hydrophone detection), the Navigator must do some math determine where the enemy is in location to the U-boat. Our first game had us pretty much swimming in circles trying to intercept the enemy ships, so again, make sure your Navigator is comfortable with the task at hand. If not, perhaps spend a bit more time going through that particular page in the rulebook. When you’re within range of an enemy ship, it’s time to sink it. Make sure your torpedo tubes are loaded, flood the torpedo tubes, aim, and fire! It sounds simple enough (which it is), but each of those actions is another order the Captain has to give, so hopefully there’s room to give them. Otherwise, you may be watching helplessly as the enemy spots you and starts dropping depth charges as you try and escape. There is a lot more going on in this game than what I briefly discussed. But, as I’ve said plenty of times already, don’t worry! Everything really is pretty simple once you get going (except navigating…for me, anyway). You’ll find that you and your teammates will get into a certain groove, and things will run quite smoothly. Until something goes wrong, of course, but by then each player will know what needs to be done, and you can get your groove back on without much more than a hiccup (or two or three…). The theme is that of World War II, or more specifically, the crew of a German U-boat as it hunts Allied vessels during the war. As far as an immersive theme goes (pun pun pun…), UBOOT The Board Game captures the essence of submarine warfare in all its glory. Complete with required mobile/tablet app that lets you visually scan for enemies and provides important information in real-time, the feeling of actually being part of the crew is captured remarkably well in this tabletop game. 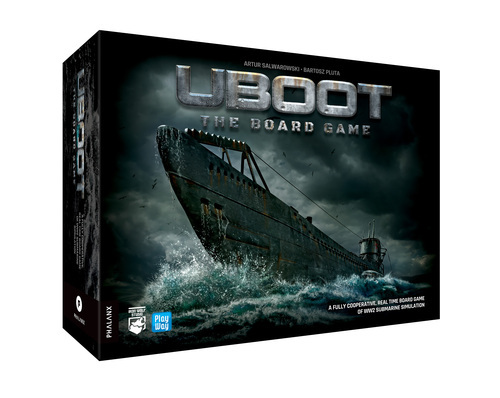 The real-time, cooperative mechanics of UBOOT The Board Game help add to the theme, as all players must be able to plan ahead, then work frantically to solve any problems that arise before they escalate. It’s much what I would expect life to be like on a submarine (including moments where absolutely nothing is happening). The order management mechanic is huge, as the captain must determine which orders are most important, or risk hurting crew morale. This, of course, is never a good thing, and it shows in the cards that come about from it. Each player has specific tasks they are required to be on top of, keeping the captain informed at all times. There’s a lot of communication involved—and sometimes some frantic moments as everyone tries to fix issues at once—so it takes some cool heads and quick collective thinking to stay afloat during the crises. The components in this preview version were, in my humble opinion, better than probably any other previewed game I’ve received. I don’t judge a game by it’s components—especially ones still on Kickstarter—but let me tell you, the 3D ship, game mat, and tokens were all impressively made. When UBOOT hits store shelves, I expect it to be the same high-quality components (only better because of additional funding). The art is pretty solid as well, and nothing looks incomplete. The app is obviously animated during periscope and binocular reconnaissance, but even in its beta stage it’s still pretty impressive. I don’t expect real-life graphics on the app, but what they have already is fine by me. 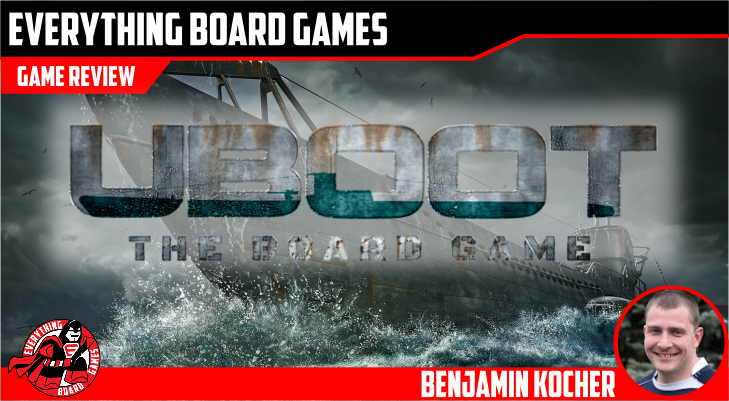 UBOOT The Board Game is one of the most thematically deep games I’ve played, at least as far as giving the players a realistic experience. The teamwork and communication is important in this game, which limits the negative impact of alpha gamers (i.e. that bossy person who basically plays all co-op games by themselves, regardless of how many people are playing). The app worked smoothly, and it certainly gave the game a unique and engaging feel. The 3D U-boat is all kinds of awesome. It’s even to a 1/72 scale of a type VIIC U-boat, which is sure to excite any WWII buff or submarine aficionado. And don’t worry about having to take the model apart and build it back up every single game. Once built, it breaks into three pieces that fit nicely inside the box. Once you get into the game, the actions each player takes are relatively simple to understand. While reading the rulebook, I was sure I’d be confused the entire time. On the contrary, after the first few orders were given, I had a good grasp of what was required of me, and how it all worked together. "Does anybody know where we are?" Navigating is a struggle. Don’t get me wrong, I thought it was brilliant, and it does work well, but for me, it took me quite some time to actually understand it. It’s really not that difficult once you get the hang of it, but I’m pretty sure my old math teachers would have paid good money to see me figuring out how to plot a course and determine my position to the enemy’s on the tactical board. But, again, once you figure it out, it’ll be clear sailing. Sometimes, as is wont with submarine travel, there’s just nothing to do. While this is under “bad” section, it’s not inherently a bad thing. For example, the app is equipped with the ability to speed up time, and then speed it up again. So if things just aren’t happening, go ahead and speed up time! No harm in a little warp or two. Alternately, you can use the down time to discuss with your teammates the best course of action to take on the next mobilization, what demands need to be met, and the like. The reason why I put this topic under “The Bad” is because, sometimes, I didn’t want to speed up time because I was afraid I would miss something. Like, say, my destination. (Remember the navigating bit? Yeah, we may have gone circles around our target destination before actually reaching it…) I just recall moments when we were cruising the seas, doing nothing, and unsure of what to do next. Here’s a hint: SPEED UP TIME! You’ll thank me later. The app was only available for Android. I have an iPhone as well as an iPad, so it’s a good thing my wife has been too stubborn to make the switch from Android to iOS, otherwise we wouldn’t have been able to play. I assume the developers will make the app for iOS as well, but for now, it’s Android or nothing. UBOOT The Board Game is impressive. From the 3D scale model of the type VIIC U-boat to the companion app, everything you see in this game has had been worked on and polished endlessly to make it the game it is today. While some aspects of the game may be a tad confusing (looking at you, Navigation), most of the areas of game play are smooth and the mechanics feel solid. While it wasn’t exactly the game I was expecting, I feel like that may be in part due to only having one mission to play, and that being a relatively basic one. The other missions, I’m sure, will add variety, tension, and lots of fun for quite some time. I didn’t get a chance to play it solo, and to be honest, I’m not sure how that would work. I feel like there may be too much going on for me to remember as one player. At least, until I’ve played it a number of times and know how each position should play. Honestly, when I was trying to learn it, I found video tutorials and play-throughs quite helpful. I personally found Rahdo’s gameplay run-through quite helpful (see video below). It’s about 30 minutes long, and gives good detail and information to get you started without giving away too much of the first mission. Highly recommended. If you’re a fan of war games, cooperative, real-time, or any combination of the aforementioned game types, there’s a good chance this will be one that gets to your table frequently. If you play with people who are constantly on their phones, this is also a good game for them, since they can be the one in charge of using the technology without anyone glaring at them when they forget it’s their turn. I will refrain from giving this a numbered rating, because I feel like I would need to play more missions to get a better feel for it. That being said, I think it's well made, and if you enjoy any of the aspects mentioned above, chances are you'll like UBOOT The Board Game. I'm excited to see it in its final form, as I imagine it will be quite impressive. 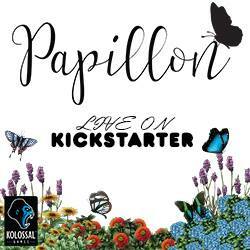 On KICKSTARTER between now and February 14, 2018.